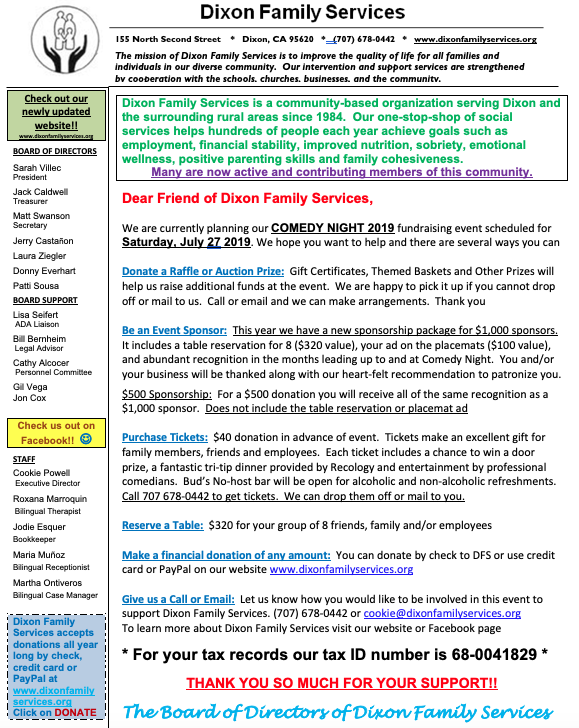 It still feels like Winter but Dixon Family Services’ Summer Fun-raising Event, Comedy Night 2019, is already scheduled for Saturday, July 27. Every year this event is a smashing hit with everyone who attends. This year is expected to be even bigger and better! The cool and elegant Olde Vet’s Hall adds a level of comfort and class to the hot summer’s funniest night in Dixon. But don’t be mistaken, this is a casual affair. Wear something with an elastic waist so your belly is prepared for a delicious tri-tip dinner and hilarious entertainment. Comedy Night has become a signature fundraising event for Dixon Family Services over the years. 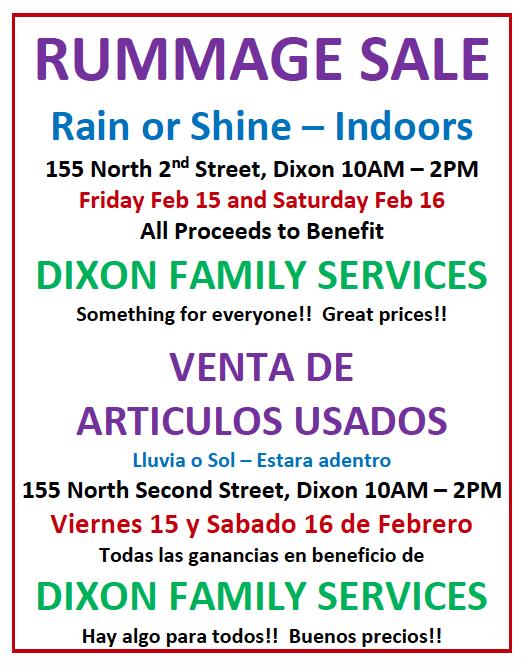 The community-based, one-stop-shop of social services has been helping Dixon’s residents who are in need of a variety of assistance programs since 1984. Co- located government programs are also at DFS. Comedy Night is an opportunity for all community members to come out and support the non-profit organization, while having a great time. The evening will begin at 5PM with social time, drinks, a chance to see a large array of raffle prizes and to socialize. Then a tri-tip dinner, courtesy of Recology, will be served at 6. Bud’s Pub & Grill provides the no-host bar. A live auction of baked goods is intended to satisfy everyone’s sweet tooth for dessert after dinner. Then, at 7:30 “The Show” begins and heavy laughter is predicted. Tickets are a $40 donation in advance and as this is a highly anticipated event, there is no guarantee there will be tickets left to sell at the door. Everyone is encouraged to get tickets early because there is a maximum capacity at the hall and tickets do sell fast. Be sure to not miss the fun, food and laughter of Comedy Night 2019 on Saturday, July 27. Businesses, families and friends can reserve a table to insure you can sit together. A table of 8 can be reserved by calling DFS or talk to any DFS Board Member. 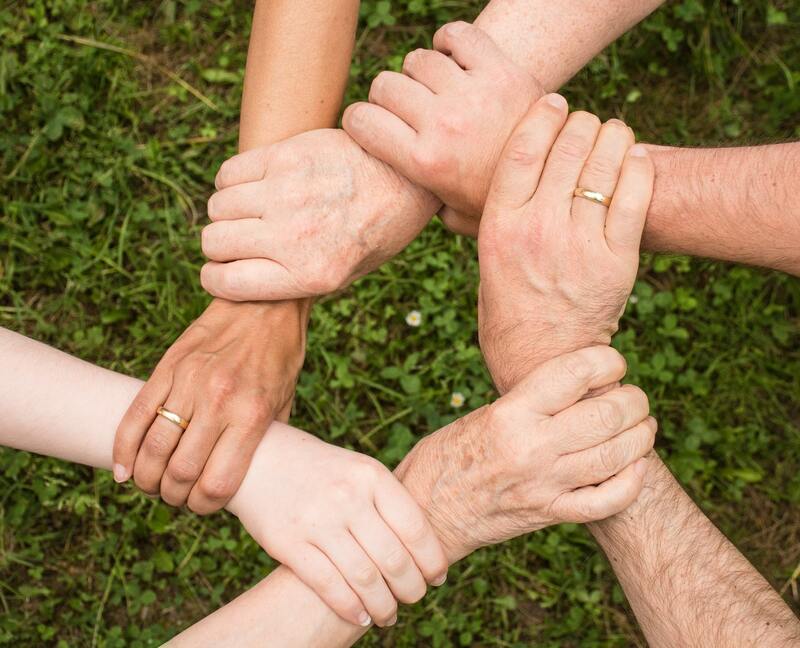 DFS board members include Sarah Villec, Matt Swanson, Jack Caldwell, Jerry Castañon, Laura Ziegler, Donny Everhart, Patti Sousa and Ranay Singh. Additional support is needed in a variety of ways. Sponsorships, donations, raffle prizes and baked goods are all greatly appreciated. For more information contact Cookie at Dixon Family Services, 678-0442, email cookie@dixonfamilyservices.org or ask any DFS Board Member. 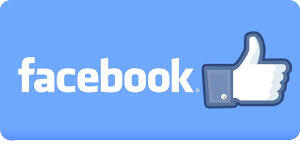 For more information everyone is encouraged to visit the Dixon Family Services website or Facebook page.